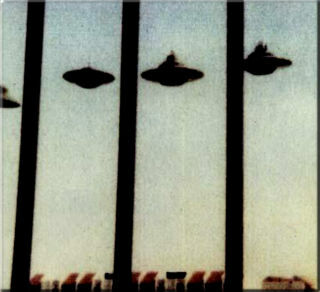 "This incredible photo was taken in 1995 by Pleiadian contactee Adrian. He used to live on the top floor of a condo complex next to a golf course in Miami, Florida. He crouched down on his porch when they appeared in order to get the patio railing in the shot to show some distance and perspective. These four craft represent various advances in Pleiadian technology. 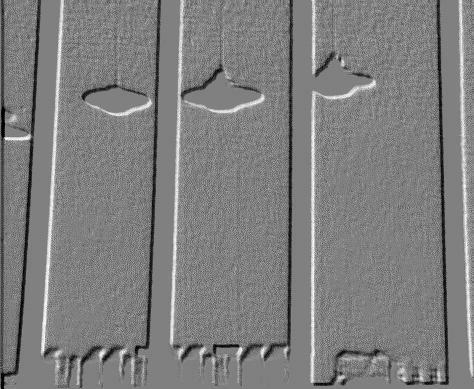 The craft on the far left, he claims, is a German craft built in the 1920s with assistance from the Pleiadians. This group of 'P's come from a planet called Romul in the Alcyone star system. This is just one of nearly a thousand pictures that are currently being analyzed. " 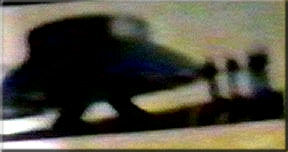 Morton also claimed that he had Adrian's alleged UFO photos analyzed, saying, "His videos and photographs are the best I have ever seen. I took the material to men who were the best in their field. Special effects wizards working on the upcoming blockbuster, 'INDEPENDENCE DAY', and NASA contractors who analyzed the material and told me they could find no fault, flaw, or evidence of trickery, hoax or fraud in the pictures..."
Hopefully Morton releases this analysis to the public when he talks about Adrian's case and the above photo.. Jeff Ritzman, a well known UFO investigator and special effects artists found a bit of a problem with Morton's promotion of Adrian's photo. You see, Ritzmann discovered the profound secret driving Adrian's UFO propulsion systems - string! Morton began promoting Adrian's case and is alleged to have told Adrian that he "could make a lot of money" from his case. Morton went so far as changing Adrian's name to 'Akron' and sending him on a speaking tour of Europe - the tour was reported to have not done well. Morton has stated several times in public that he possesses a video allegedly showing Adrian boarding a beam ship and then flying off. While Morton has been boasting about this tape for quite some time, the public has yet to see it. Since the source of the information is Morton, that automatically makes it dubious at best. ABOVE: Photo from Morton's website. About the photo Morton states, "Circa World War II picture of a landed VRIL or Hannabu class flying saucer with engineers and pilots, allegedly taken at a German UFO base somewhere in Europe." 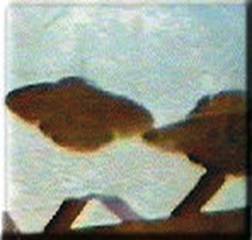 On the same website page appear two photos alleged to have been taken by Adria of Pleiadian UFOs at a secret landing base. LEFT: Morton states, "A fleet of Pleiadian craft, nearly 300 feet in diameter are seen here landing at a secret Pleiadian base supposedly somewhere in the Matto Grosse area of Central Brazil." 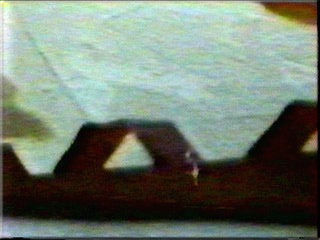 RIGHT: Morton states, " Taken again by Adrian, we see the detail of a man standing at the foot of a series of landing/launching pads."